Out of the many different formats out there, there are few that are polar opposites in the way that MOV and WMV are. Because MOV was developed by Apple and WMV was developed by Microsoft, both have been competing with one another for years on end. On some Windows PCs you may have difficulty playing MOV videos for this reason, and may have to download QuickTime if you want to watch them. Assuming you’d rather not do that there is another option that you can try with Movavi Video Converter: Convert the MOV video to WMV instead. Converting a MOV video to WMV is really very straightforward in Movavi Video Converter. All in all it should only take a few minutes to set it all up, and if you want you can get started right here and now. The first step you need to take is to launch Movavi Video Converter and click on the ‘Add Media’ button then click ‘Add Video’ and select the MOV file that you want to convert. Another option you could try is to drag and drop the file into the main working area, as that will add it to the software as well. Next up you will need to select the format, and you can click on the ‘Video’ tab in the bottom part of Movavi Video Converter’s interface to see the selection that’s available. In this case you will want to select the ‘WMV’ category of presets and pick the preset that has the resolution that you want to use. If you don’t want the resolution of your video to be changed, just select the preset labeled ‘Original Size’. That is really all that you need to set up to convert MOV to WMV, and you can click on the ‘folder’ icon near the bottom of the interface to set the destination folder. Once that is done the only step that remains is to click on the ‘Convert’ button and let Movavi Video Converter transcode your video from MOV to WMV. As you can see there’s nothing complicated about the process of converting videos with Movavi Video Converter, but if you’d feel more comfortable with more detailed instructions head over to www.movavi.com/support/how-to/how-to-convert-mov-to-wmv.html. It should be noted that you can follow the same steps if you want to convert other video formats, or audio and image files as well. On top of that there are other features in Movavi Video Converter that you can try out, and will enable you to create animated GIFs, extract audio tracks, grab screenshots, compress videos, add captions, and much more. 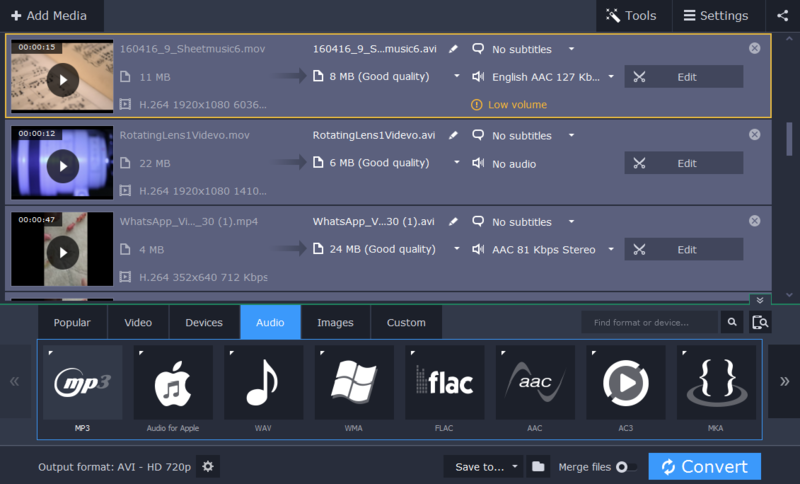 All said and done Movavi Video Converter’s features pack quite a punch, and it would be worth your while to explore what it can do. While its features are extensive however, they are designed to be easy to use – as you can see from how easy it is to convert videos with the software.